An Italian information technologist believes that superimposing Leonardo Da Vinci's famous Last Supper with its mirror image reveals a figure who looks like a Templar knight and another holding a baby. 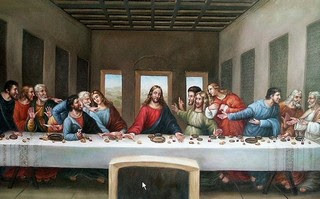 The new theory that Leonardo's Last Supper might hide within it a depiction of Christ blessing the bread and wine has triggered so much interest that websites connected to the picture have crashed. The famous fresco is already the focus of mythical speculation after author Dan Brown based his The Da Vinci Code around the painting, arguing in the novel that Jesus married his follower, Mary Magdalene, and fathered a child. Now Slavisa Pesci, an information technologist and amateur scholar, says superimposing the Last Supper with its mirror-image throws up another picture containing a figure who looks like a Templar knight and another holding a small baby. Websites had 15 million hits last Thursday morning alone, organisers said, adding they were trying to provide a more powerful server for the sites. Madonna, Templar hidden in masterpiece, says expert. Michael W. Domoretsky in 2005, The True Code! As usual, as is our experience repeated time and time again, renowned art critics and professed art experts, such Vittorio Scarbi and many others, base their opinions on accepted art world and art education precepts looking at DaVinci’s works as artists not scientists, inventors and very likely a member of the Mason’s guild (though unproven). Few if any of these “accepted” experts have read his notes in detail or studied the man himself and thus fail to understand and make the connection that he worked outside the box. DaVinci was known to have used mirrors extensively in his writings. It is therefore highly likely and to be expected that he would do something similar in his paintings if he sought to hide ideas, concepts or opinions. We submit that only someone “as ignorant as a goat” could fail even to consider that a man of DaVinci’s genius and propensity for innovation might possibly think and communicate outside the box, with hidden images, or hide his, what might possibly be considered, heretic or dangerous free thinking ideas by encrypting them in his works of art. Secrets of the Mona Lisa discovered within fabric of her right sleeve, in optical illusion form, the true name ‘MARY’ appears. On Style, light, shade and hidden messages, hidden within the optical illusions of Leonardo da Vinci Masterpieces. The best of da Vinci’s genius is not his paintings as art. Yes, the art is exquisite, world class when viewed as art but what he put within and even more importantly outside the frame of the art is quickly becoming recognized by more and more people world-wide, as the proof of his absolute all time world class genius. The art techniques he developed were cutting edge, seminal and unique, never before seen brushless masterpieces…but even these revolutionary techniques and artistic quality pale when compared to the intellectual encryptions the master scientist, mathematician, engineer and yes artist placed within the artworks using even more astonishing techniques, hundreds of years ahead of his time. One such technique used by Leonardo was the optical illusion; the subtle use of light and shade to give the impression of visually expected objects and effects, while masking a second and to him more important item, message or visually illusive construct. Such is the case in the Mona Lisa. In the portrait of the Mona Lisa, Leonardo showed a mastery of art technique that was unknown at the time. He created the Sfumato technique that in Italian means vanished or evaporated. With this technique, subtle transitions between light and dark are used creating soft haze. He uses shadow in the lowest areas of the picture, in the background and around the edges to blur detail that draws one to the detailed area of the face. Her face emerges from the shadow areas of her hair and veil and her hands appear from the vague yet detailed folds of the sleeves of her dress. The shadowed areas at the corners of her eyes and mouth are faintly blurred. Looking at the subject one may notice that the right corner of her mouth seems to lift up slightly and the left side her mouth does not. She looks serene and comfortable sitting for Leonardo. The degree to which she looks alive is astonishing. This is the artistic genius of the master… however…. Under magnification, the possible existence of an extreme subtlety that only Leonardo could create with his superior scientific understanding, the brilliantly disguised interplay of light, shade and technique, the name.... Mary. It appears to emerge from the gathered folds of her sleeve. The optical illusion within the folds spells out the name MARY, in a deliberately and carefully interrupted flowing script. It may very well be the name Leonardo had in mind for what has become the most famous painting in the world. After a number of years of intensive, detailed research by Michael W. Domoretsky and the da Vinci Project™, and, after contemplating and studying Leonardo's extensive writings in his manuscripts (codices) on light and shade and his theories on perspective and color, what came to light in early 2005, is that Leonardo, a genius known for alternative methods, appears to have applied his superior scientific understanding to brilliantly disguise the true name of the subject in the Mona Lisa, his most treasured painting. Using interplay of light, and shading techniques, clearly visible but hidden in plain sight, it appears that he deftly and discreetly included his chosen name for her within the detailed folds of her sleeve. Leonardo, a genius known to be secretive and brilliant in his methods, appears to have applied his superior scientific understanding, brilliantly disguised interplay of light, and shading techniques, to give his subject a name by carefully creating an illusion within the fabric of her right sleeve. Under magnification, the word MARY emerges from the gathered folds. Within this apparently deliberate optical illusion, ‘MARY’ appears as carefully interrupted flowing script. It may very well be the name Leonardo had in mind for what has become the most famous painting in the world. Using ingenious artistic methods and unrivaled scientific knowledge pertaining to the innate nature of the cause and effect of light, enabled Leonardo to create an interwoven optical illusion within the subject's sleeve folds that traces out the name MARY. Thus, giving us a glimpse into the vast depth of genius that was and still is Leonardo da Vinci. The true meaning of his hidden messages, some call the da Vinci code, while discovered, remain mostly undeciphered to this day. From a stylistic standpoint Leonardo introduced the waist up, hands folded in the lap type of portrait. The pose was immediately copied and greatly admired. The pose became fashionable for portraiture by such painters as Raphael and eventually became an accepted standard for the Renaissance portrait. It is very interesting to note and speculate upon the reason(s) that the Mona Lisa was never delivered to Gioconda family. It remained with Leonardo da Vinci until his death in Ambrose, France in 1519. The painting was his most cherished and protected possession. He loved the portrait so much that he carried it with him on all of his travels throughout Italy and in his later years while conducting studies at the Vatican. He kept the painting with him while he was in Ambrose, France where he spent his twilight years. Why? Is it because it held meaning beyond the actual artwork, exquisite though it was? Anything hidden could very well have been construed to be the “work of the Devil” by an overly repressive and dominant Catholic church of the time. Or are there other reasons? The da Vinci Project ™ is in the process of attempting with painstakingly detailed research and review, to discover all of the hidden images within and “outside the frame”™ in order to formulate a cohesive and comprehensive theory based on facts and proofs that answer many of the questions left by one of the greatest: scientists, mathematicians and yes art masters in all of recorded history, Leonardo da Vinci on the left picture, taken from the original painting called "The Mona Lisa", by Leonardo da Vinci, is a cropped version of the left sleeve facing you, place mouse over image of the name, underneath is a cropped version in negative form also for your viewing. Now, also notice the cross bar of the letter A, the name discovered on the original painting, found to be the name. "MARY", the true name Leonardo intended for her. Reflections, mirror image page of web site, bottom image. These are the best images on the entire Web, with close-ups of individual people that you can enlarge.